New series here on TropicalBass.com! You might have run into Andrès Cumbia Weekly Roundup or Leub’s Reggae & Dancehall Roundups. Now, with the Soca roundup we want to give you a selection of new tunes of Soca and other styles like Bouyon, Calypso and Steel Drum. The Caribbean, esp. the Lesser Antilles, are still a hotpot when it comes to fresh music. Your trustworthy hosts of the Soca Roundup are Dave, the soca die-hard from Paris and Marflix, de original bacchanalist from Berlin. Drop us a note in the comments how you like this new section on TropicalBass.com and what you’d like to see more in future episodes. Before we start we have to rate this mega banger by Bristol-based team Jus Now. This one will blow up every roof at every Soca party on this planet! Very nice R’n’B’ish track produced by UIM Records (Jamaica) including a black and white video without the usual Carnival stereotypes. In opposite to Shurwayne, Trinidad’s own “Saucy Wow” is 100% Carnival with tribal costumes and – of course – wining. Nice out-take of the Project 5 Riddim by StarBlu Ent. & Millibeatz Ent. Another official video-clip representing Trinidad Carnival – Blaxx from the Roy Cape Allstars. Nice and mellow groovy track by Antigua’s Supa Mario, who simply likes the girl to wuk it! Amazing remix project by the soca label Faluma: Tropical Bass producers from all over remixing Blood from Barbados. Remixes by SoShifty, Murlo, Poirier and many more. St. Thomas in BVI’s just had it’s Carnival. This smasher is by Jammerz HP. More VI Soca, but moving over to St. Croix with this bad tune by Fusion Band. 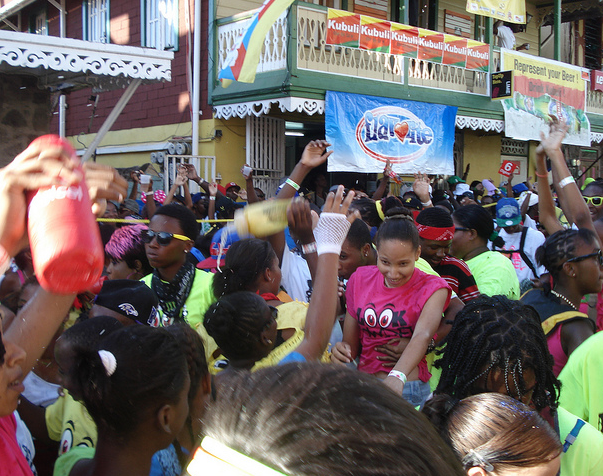 Picture of Roseau Carnival by Julia.